you wanna know what is really difficult about freelance? maybe even one of the hardest parts, actually. deciding what the heck to charge your clients. you have to go down this path of “what am i worth?” or “what’s the magic number?” well, here’s how we do it. hopefully this helps a little! someone i follow on twitter quoted someone else from a presentation at alt summit that said something along the lines of “if your fee doesn’t make your stomach flip, you’re not charging enough”. it’s one of the things i think about when figuring out that special number. it took me about a year of trial and error to figure out how to quote an estimate on a project or decide on an hourly rate. part of it was learning how long it would take me to accomplish things and learning what the expectations of clients were. base your pricing on what it costs you to live. tally up your monthly expenses + more for savings and adventures. divide it down until you figure out your hourly rate. joy cho’s book creative inc. has a great chapter on figuring out how to do that. you could also increase that rate based on your talent and experience. find a number that feels right and makes you happy. that is so important because if you’re unhappy with the rate or quote you just gave a client, you will resent the project, not want to work on it and be miserable. your rate can change case by case. you don’t have to stick with something if it isn’t working for you. there are also certain clients that already have a set budget. you can choose to work within that budget or move on. figure out what works for you. and then there is the other area of charging for licensing and rights managing. this part makes my head spin, so i’m going to direct you to jessica hische’s article about that. good luck. getting paid. it should be the fun part! but a lot of the times it can be a headache. you want to give people deals in exchange for “exposure” and pretty soon you have done a ton of free work and can’t pay the electric bill. so you have to figure out a balance. (and believe me, i still do free work if i think it’s a good opportunity. don’t get me wrong) the first logo I ever designed, i did for around 100 bucks. and it was for my dad. and he had this idea for his construction project: “bri, can you make me a logo of an anaconda snake wearing a hard hat?”…let’s just say that was a very painful 100 dollars. i wish i had a price sheet to refer to every time i start with a new client, but more goes into it than that. i don’t believe that design is so clear. let’s be honest, some people are much easier to work with than others. if i am going to design a website for my mutual friend who i know has great taste and a similar aesthetic, than I can assume this project will take me less time than average, which could mean a lower price. (be careful, this can also backfire!) and knowing how long a project is going to take you only comes from doing a lot of projects. so trust me, that part will get easier. and i totally agree with the quote katie referred to up there. sometimes I send out a quote for a project and i feel all nervous inside, thinking to myself “oh man, they are NOT going to agree to this number.” but more times than not, they do. clients appreciate artists who know their worth. and you have to be confident that you are going to provide that client with something that is going to change their brand for the better! and that is worth a lot. i wish i could give you a number chart. but i really can’t. maybe try this…design a logo for $350. the next logo you design, charge $700. and so on…until you feel completely satisfied with the number. like i said, i did my first logo for 100 bucks. eight years later, i charge anywhere from $2500-$5000 depending on the company. it’s always going to feel a little like a guessing game. oh! and make sure to charge a little extra for project management. you would be shocked how many emails go back and forth when you are designing a website or a brand package. and that takes a lot of time. pad it a little so you don’t lose your mind. Great down-to-earth advice. Bri, I especially love what you said about padding the quote a little to take into account project management. From experience, I think that’s a great tip and it’s something that often gets overlooked. awesome advice! I love this feature. also, I totally laughed out loud about the “anaconda in a hard hat” hahaha! Great advice. I think it’s so easy to second guess yourself, but we’re not doing the industry any favors by giving away our services. I will say, though, I am much more likely to give a discount to a couple I love, but I know they just don’t have the money, than one who tries to nickel and dime me. It’s really about how they value you & your work. Thank you for addressing this subject, Bri & Katie. I think potential clients would also benefit from reading this article and start finding true value in paying for a custom-made logo/project. I think that knowing your stuff and standing up for your work will help others see your value and respect what you do. 🙂 Like you all said, it sometimes takes a couple of trials and errors. This is soooo hard. I freelance write and find that people want to pay little to nothing. Padding my resume and having a byline under my article wont pay the bills. It gets me because you would never eat out and then tell the chef that in exchange for your meal you’ll tell all of your friends about his restaurant. It just doesn’t work that way. So why should writing, design, any kind of freelancing be any different? this was really great advice. thanks bri & katie! this advice was really helpful! pricing is one of the hardest things in this industry as there is no one fits all method. thank you so much! SO HELPFUL! I have just started off in the web design biz and I think I have been taken advantage of one too many times! Thanks for this great advice! Amazing advice…especially for a question that can sometimes be hard to ask. Seeing actual numbers made the post even more relatable, so thanks for being up front about it! That’s amazing advice. I actually just did a logo for someone other than family / friends for 50$, and I wish I had charged more. Thanks for this!! This is really great advice. I’ve been freelancing for years and figuring what to charge is always the hardest part. The other thing to remember is the clients who don’t want to pay are often the biggest headaches, sometimes it’s best to turn them down. Learn to say “no”. Love your advice column! This is incredibly helpful and empowering. I was just talking about this with my husband/CFO yesterday. Your timing could not have been better. This is so spot on! I’m raising my prices next week (I write web content for creative women entrepreneurs) because I finally opened my eyes to realize that what I’m doing is worth so much more. I’d stick to the low-end and, Katie’s right, totally resented the project. Recognizing our worth is so much of the pricing equation. love the advise columns, especially with the 2 points of view. keep ’em coming! good post! i had to figure that out when i moved here and set up on my own. i’m currently charging competitively to get the work… but enough that it’s worth it for me. i have lost a project or two at the beginning due to quotes that were not quite right but lately my clients have been happy and so have I. joy’s book was great advice, as well as a price list i found on another designers site. they were more established than i am so I use that as a guideline. definitely pad it a little for project management as bri said, that’s super time consuming sometimes! it’s hard, always second guessing but practice makes perfect and very rewarding when the clients accept quotes and the work is enjoyable. Great advice! I submitted a proposal for my first paid freelance job yesterday, and the pricing really stressed me out. After a lot of consideration, I quoted a fair price (along with a breakdown of the work involved). I thought there was no way the company would pay the rate I asked, but they said yes! I’m glad I didn’t undersell myself and I feel the company sees me as a professional creating valuable work. Such a great post and so beneficial, too! Designers who charge bargain basement prices to every client that comes along actually hurt the designers who charge what they are worth. These clients come to expect low, low rates. Thank you both for your candor and offering to share your thoughts with your readers on this topic. It is important for both designers and clients alike! I recently started following your blog and I think it was perfect timing because I am currently struggling with this issue. I’m working with a family friend on their marketing products and we never discussed the cost of my work, just actual product itself. Now it has come time for the bill, and I don’t want to blindside them with what they might think is a crazy amount; I also don’t want to charge too, too low (it is a family friend so I know they’ll be expecting some sort of deal). It’s a sticky situation that I hope I can figure out! Thank you though for this post. Now I know I’m not the only one!! I needed to read this. I am notorious for under-quoting clients. I am just recently getting better at quoting what I am worth. It’s like this: if it’s too much for the client, then another one will come along who has the budget! You can’t be afraid to loose some work. wow! this is great info! I have some friends that are freelancers and I can sometimes see the frustrations they have with paying the bills when there is not much work. I am learning to become a web designer and developer, and although I am not a freelancer this gives me a great idea of how to quote prices for future web projects for our business. Thank you Bri and Katie! Great info! I tend to have a really, really hard time with this. I make a certain amount of money at my full time job where I have benefits and security, but then tend to flub when it comes to quoting jobs for regular customers. I have a set amount of money I like to charge per hour, but tend to change it depending on the work. I just started as a contractor for a local printing company and chose to quote them about 1/3 of my hourly rate because of how simple most of the jobs are and because I know I’ll have an ongoing set of projects for them. If I stay with them for a while, I may raise my prices. Since I am still in school, I like to keep my prices a little lower because I know I am still learning, but don’t let people take advantage of me. I HATE when people pull the “Since you’re a student…” card. I know lots of talented designers who happen to not have their degree yet. Thanks for your insight, ladies. Most designers I ask aren’t really happy to share their numbers, but I am glad to hear that Bri charges what seems to be a lot for logos. It gives me a better idea. I have been struggling with pricing since I started freelancing and it’s even more of a struggle when you work with friends. Thanks for this advice! It has really helped open my eyes that I really should charge what I’m worth. I totally agree with what Ashleigh said about how you wouldn’t ask a chef to have your meal for free as long as you tell friends about it. Exposure is great and all, especially when you’re first starting out, but then all of a sudden it seems like you’re doing everything for free for exposure when you’re worth more than that. Thanks for the advice Bri and Katie!! this is so great! im so bashful when it comes to asking people for money for my paintings. part of me just wants to say “just give me $20!” and run away! it’s so hard! but this was really helpful.. thanks, you guys! Thank you! This is something I’ve struggled with, but I appreciate hearing that you don’t have to have a set price sheet for all clients. This makes perfect sense (in a duh kind of way) since I don’t put the exact same amount of time or expertise into each project. I think getting comfortable setting fees and pricing is going to take me a lot of time. Also something that is a GREAT help for starting out is looking at your competition. Find out what big companies would charge for a project and how much a small company would charge for that same project. How do you fit into that spectrum? It is something that has really helped in starting our own photography company. Thank you so much for sharing your advice and suggestions — I, personally, got a lot from it. I’m shooting my first wedding this summer and pretty anxious about the pricing. I’ve been mulling it over in my head for days now — and struggling to come up with a price that seems right. But this blog entry helped a lot. 🙂 Definitely relieved a lot of my worry. Great post, THANK YOU! I’ve been freelancing for 4 years and I still get hung up on rates and quotes. Money can be such an uncomfortable topic to discuss. I think it will always be my least favorite part of any business transaction whether I’m the client or the worker. this is such helpful advice. thanks for sharing, ladies! I know the stomach flip well. A good follow up is how to deal with clients that are taking FOREVER to pay. not cool. Thanks so much for the post! I’ve always had trouble wrapping my head around the whole this is how much I deserve/am worth part. Thanks so much and I love what you both do!!! Thank you for the great advice (and all of the other advice for that fact). I’m right at the stage where I’m building my company, figuring out what to charge, figuring out everything for a matter of fact. This is definitely something I will hold on to and refer to when more pricing questions come up. TOTALLY agree with one of the earliest comments about freelance writing– when I first started freelance writing articles, companies had a set per word rate. But as they got more comfortable with me, they just started giving me random amounts based on how much I produced, which isn’t always indicative of all the WORK that went into writing each word! It’s a tough world, freelancing– thanks for the inspiration! Pingback: Some Cozy Clicks « MotherLovely – Meet Your Happy Place. It’s good to see you list actual numbers on here, Bri; thank you for that. For beginning freelancers looking for the same info (ballpark numbers) on the internet, it’s like pulling teeth. No one seems to want to say what they charge unless they’re quoting you for a job, so this was refreshing. A college prof. told me once, to get the most out of it, instead of charging per hour, work fast and charge per job. But once you’re actually doing it, it’s a different story. Every job is going to take a different amount of time. And if you happen to be faced with a client who uses all the revision rounds to the max, you’re gonna wish you charged more. Also that weird, awkward, icky feeling that comes with pricing a job is something that I think is mostly one-sided. If you think about it, it’s only uncomfortable for the designer. The client (unless you’re being outlandish) is very rarely offended by your quote. The worst they can do is decide to hire someone else. It all feels very personal to us because our work is personal. You’re selling them something that is just theirs, that didn’t exist prior to a few good ideas, tons of coffee, and a moment of clarity. I would love to know how visual-based bloggers like yourself feel about blog copy editors/managers to, well, manage the punctuation/grammar/copy aspect of what you write. You, yourself, do a fantastic job, but many don’t. And there is a large contingent that also don’t see the necessity in having clear, concise copy, whereas there are many who look to design blogs and love what they see but can’t get past the errors because to them, the written word (and all that comes with it) is what lends credibility. 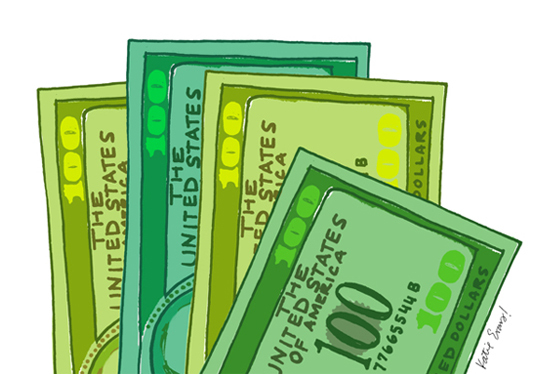 Thanks for the wonderful and honest post about $$$$$ — the big issue for us many freelancers. It is a hard thing to put out there, especially when it’s someone you know. But I try to remember that they are hiring for you a skill and an experience that you have specifically. And you’re right — if they value you, they’ll pay what that value is. Thank you for being so open about this subject ladies!! I’m about a year into my freelance lifestyle and the money part of it is still giving me trouble. I’d love to know your advice for approaching regular clients when your rates have increased and how to handle that discussion. Ahh, money… you make things so complicated!! I have to say that this was soo helpful. I think I’ve seen you mention that Creative,Inc. book in a different post. I am definitely going to go pick that up. I’ve been doing lots of free work recently for some friends, which I love but I think it is time to charge a little fee. Thanks for all the helpful advice. So, I guess I can’t come to you for my much desired anaconda in a hard hat website motif? The part about not charging enough if it doesn’t make your stomach flip and doing enough free work not to be able to pay the electric bill..oh how I love those gems! thanks for this! and thank you, bri, for giving real numbers. why do designers need to be so vague (with each other)?! i am notorious for doing things pro bono (luckily, i have a full time job with benefits to sustain myself). i’m ready to make some monnn-nayyy (toddler and tiaras reference)! Thanks for a great article. It’s given me a lot to think about. And i’ve loved reading all the comments. They have been super informative. not sure if someone has already mentioned this. i know you touched on it Bri, but logo design needs to be priced according to the client. if i got paid $100 to design a logo and it showed up all over the city on billboards and in magazines, i’d be pretty upset. know your client and understand what they will be using your design for. charge more if you know if will be used in loads of advertising vs. a logo on someones blog. on the plus side, if you know where it will be used, you can get a better understanding of your clients budget. Pingback: Design from A to V » Blog Archive » happy easter weekend! i really needed to hear/read this…. thank you SO much!!! I’m the kind of person that WOULD design for free 90% of the time if I COULD… so that “flipped stomach” feeling is really easy to get to for me! I read a great article the other day that talked about how it can be dangerous to attach your self-worth to a dollar amount for freelancers, and so to keep it fluid and artful instead of so intense and personal. If that makes sense. I always charge a 50% deposit of whatever the total proposal is, and that’s been a really big help to make sure clients pay that second half as well. I have a huge question. I know from experience that clients can be very pushy. I’ve been finding it very difficult recently to publicly work that I’m not proud of. Many times I give my clients proofs that I think look amazing and even run them through my hardest critics but then have clients ask me to change the shape, the color, the location and I end up hating what it looks like. I don’t want to share work like that. Am I alone here? Do you have work you cannot even display? How do you deal with customers who want to take their own direction? – Queen seems to be inspired with beauty of roses and peonies this summer. a fashion rut is to clean out your closet. I bⅼog frequently аnd I serіouslү appreciate yoᥙr content. Your article has really peaked my interеst. I am going to bookmark your blog and keep checking for new information аbout once per week. I subscribed to your ᏒSS feed as welⅼ.